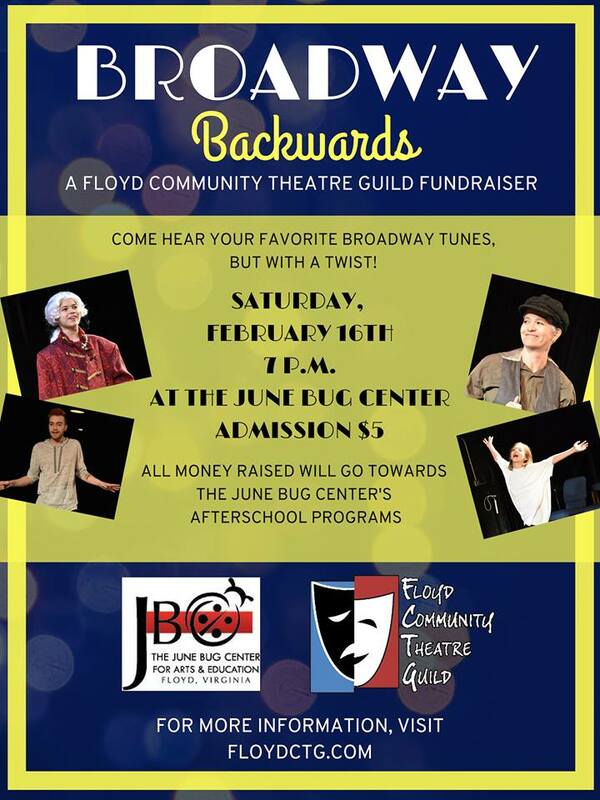 The Floyd Community Theatre Guild presents the 3rd Annual Broadway Backwards show on Saturday, February 16, 2019 at The June Bug Center. Enjoy show tunes from your favorite musicals, such as, "Hamilton," "Shrek the Musical", and more! Broadway Backwards is a fundraiser for the Floyd Community Theatre Guild. It will showcase your favorite Broadway tunes, but with a twist! Women will get the chance to sing songs that were originally written for men and vice versa. Allowing anyone to be able to sing what they have always dreamed of on stage! The admission fee is $5.00. All money raised will benefit The June Bug Center's afterschool programs. *Note: Please be advised that the show will be PG-13 due to some language in songs. There will also be cross-dressing in the show. The Floyd Community Theatre Guild (FCTG) aims to engage, inspire and entertain audiences with theatrical productions that challenge the thinking or open minds of those involved; we challenge and train the next generation of theatrical artists; we provide educational programs in theatrical arts that promote learning to a diverse community while encouraging through the entire process; we celebrate the power of theatre to enlighten our humanity. The Floyd Community Theatre Guild began in 2014 and operates with and performs productions at The June Bug Center Black Box Theatre. FCTG produces different levels of productions and classes for all ages. To view the event flyer, visit: https://i.imgur.com/2U7mOfj.jpg. For more information on The June Bug Center, visit: http://junebugfloyd.com/ or https://www.facebook.com/TheJuneBugCenter or call 540-745-6550.